Here you will find some practical underwater welding exercises for you to try, in the workshop, before you dive. 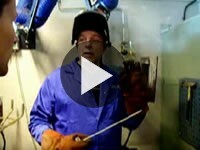 There are 3 basic 'touch' techniques used in underwater wet welding and each is shown in the videos below. 1 - Drag technique is the simplest of techniques and only requires you maintain touch contact and keep your lead and/or slope angles within the specified range. All things being well, this is the only technique you need. However, welding doesn't always work like that! 2 - Step-back is much more difficult, as you know need to now interrupt travel speed and push back into the weld puddle. This is carried out at a consistent rate during the welding operation and requires good visibility and a sensitive touch by the diver. Also, the distance in the step-back push needs to be carried out with great care and control. This is used to reduce the cooling rate and at the same time helps deposit more metal per mm. 3 - Oscillation is the term used to describe the movement used. Underwater we don't weave, although oscillation is the next best thing. Instead of moving the electrode tip from point A to point B on the base material, you move your hand from side to side, at the elbow, to simulate a weave. This technique is used to help with difficulties that 'drag' technique cannot overcome. Mainly used for the root pass, as it helps form the correct shape of weld in the root of the joint, by spreading the weld onto both faces. Watch the videos and then try the exercises for yourself. More videos are on our YouTube channel.